We’re always talking about the amazing safety features of Honda vehicles, but there are some things that can’t always be prevented. At Henley Honda, your safety is our number one priority, so we’ve decided to introduce a new blog series to teach you how to avoid accidents and handle emergency situations to keep you out of harm’s way. Check back often to find out how to keep yourself and your family safe, no matter what the road throws your way. 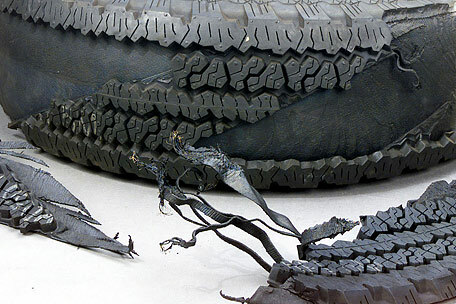 A tread separation is what happens when the tread rubber and the steel belt underneath come off a tire. When a separation happens, you are left with tire shreds and a blade of steel-backed rubber spinning at a high speed. Be mindful if you hear a long thumping noise that turns into a slapping. When a tread separation occurs, it sunds like a jackhammer. The time of the progression from warning sounds to a tread separation can be days or seconds, so if you suspect a tread separtion, get off the road and have the tire inspected. To safely get through this situation, you are going to deal with it similar to a tire blowout. Push the gas and keep your vehicle driving straight. Your natural reaction will be to brake and get off the road immediately. Ignore that instinct. The best way to avoid an accident is to coast to a slow speed and gently pull off the road. If you head for the shoulder that is on the same side as the blown tire, it will be safer when you change it. But this is a much more dangerous situation. If you do not slow down and stop quickly, the debris from the damage can cause damage to your brake lines, fuel tank, rear seats, inner fender panels, windows, or you and your passengers.